Writer turned blogger extraordinaire Dermot Cole wrote recently that OMB Director Donna Arduin is considering whether the state should be the recipient of all property taxes paid on oil and gas properties instead of cities and boroughs who are the current recipients. And, surprise, that is one of the key legislative proposals introduced along with Gov. Michael J. Dunleavy’s cuts-filled budget. His proposal seeks to funnel all property taxes levied on oil and gas infrastructure to the state, barring municipalities from levying their own. It’s a huge deal. First, it will devastate the North Slope Borough communities, and Valdez, substantially. The North Slope Borough provides services to Alaska Native villages across the Slope from its seat in Utqiagvik to places like Pt. Lay, Pt. Hope, Anaktuvuk Pass, Nuiqsut, and others. There is no backup to fund the North Slope Borough budget in any other way than property taxes. Under this proposal, communities across Alaska will have to contend with new, and in some cases insurmountable, budget deficits they never saw coming. Secondly, this approach highlights the impetuous nature of Dunleavy and Arduin’s budget decisions. If the state really needs “live within its means” as those two are always crowing, why then is there a proposal on the table to bloat state coffers, at the expense of local government, by another $439 million? Despite this administration’s steadfast refusal to consider new revenues, they are indeed doing just that, possibly causing great injury along the way. Couple this with the elimination of the Power Cost Equalization fund and one couldn’t be faulted for thinking rural Alaska is in danger. Some quick background. 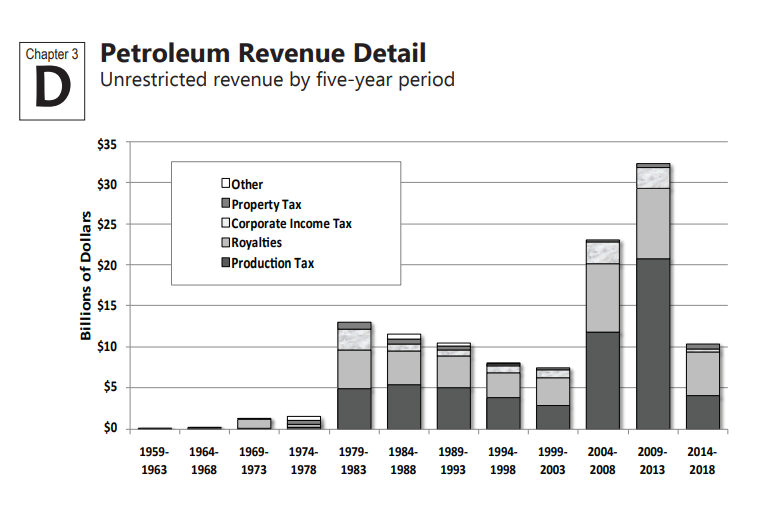 The State of Alaska receives revenue from oil production in four ways: royalties, production taxes, property taxes and corporate income taxes. Royalties fund the Alaska Permanent Fund and make up the bulk of the state’s UGF revenue ($865 million FY20) pre-POMV. Production taxes, oft debated in Juneau, have at times brought in up to $6 billion in UGF revenue. In FY20 they will bring in about $479 million. Corporate income tax is levied on oil and gas corporations as a percentage of their worldwide net income apportioned to Alaska bringing in about $210 million in FY20. Property taxes are collected as a percentage of the value of taxable oil and gas property. A portion goes to the state and a majority goes to local landholders (municipalities, boroughs, cities, and unorganized areas) who own the property. As you can see from the chart below, the gross property tax collected in FY18 was $439.9 million with $122.7 million going to the state and the remainder going to local communities along the TAPS route. Critically important to the conversation here is where the rest of the money goes. Anchorage and Fairbanks, populations centers, aren’t raking in money, but it’s not insignificant at $2.4 million and $11.8 million respectively. The $15 million collected by the Kenai Peninsula Borough is nothing to sneeze at nor is the $38 million that goes to the City of Valdez. But, by far, the largest recipient of the $439.9 million collected is the North Slope Borough collecting $372.1 million in FY18 in oil and gas property taxes, funding a budget, and putting some away in savings, from those earnings. Most Alaskans understand that the majority of production in the state comes from the North Slope. Coming in at 94,796 square miles, the North Slope Borough is enormous geographically and covers the entire oil production region at Prudhoe Bay and beyond. The North Slope Borough, incorporated in 1972, is almost completely funded by property taxes and has been since then. Discussion on tax on oil and gas properties, and local governments share in that revenue stream, dates back to territorial days. But between 1972 and 1980, the Borough collected more than $150 million in property taxes. In 1980, as production ramped up, the North Slope Borough collected $74 million that year alone. 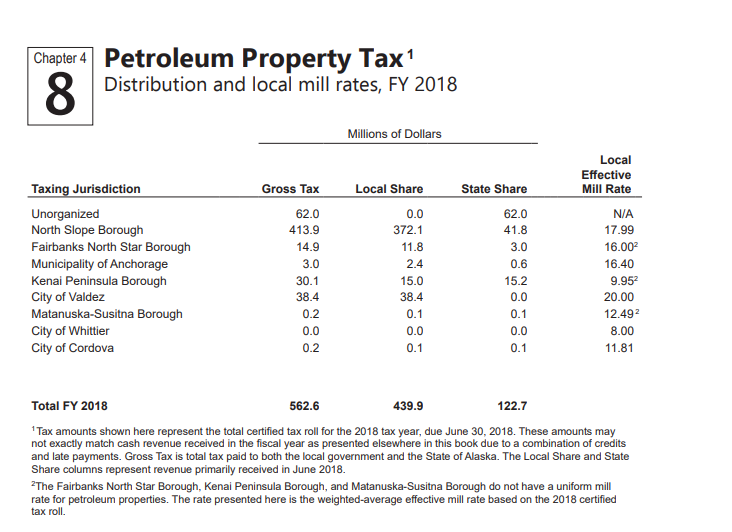 Today, as then, the Borough sees about 90% or more of its budget funded by property taxes levied on oil and gas activity happening on its land. The Borough spends a significant amount of capital working to make Utqiagvik and other North Slope villages more self sustaining. In one move, Donna Arduin and Michael J. Dunleavy, could completely change the way of life for every resident on the North Slope, and many across Alaska, on a fundamental level that many of us could not imagine. The North Slope Borough’s FY17 budget of $449.4 million was made up of $354.9 million in property taxes. Taking $372.1 million from the North Slope Borough, and devastating the region would fall far short of the the commitment to protect Alaska Native communities Dunleavy promised on the campaign trail. The flippant mention of it in with few details or context by Outsider Donna Arduin further reminds us how out of touch she really is with Alaska. And don’t discount the effect $30 million has on the $78.8 million Kenai Peninsula Borough budget, of which $15 million is funded by property taxes. Or maybe consider the $38 million hit to Valdez, a district Dunleavy once represented in the senate, where “oil and gas properties comprise 88% of all property tax revenue, and 82% of all General Fund revenue.” Such an enormous policy move would fly in the face of Alaska history and common sense but it would also decimate the already strained budget of municipalities around the state. 1 Comment on "Dunleavy’s oil and gas property tax bill would funnel $439 million from communities to state coffers"
Article is wrong. 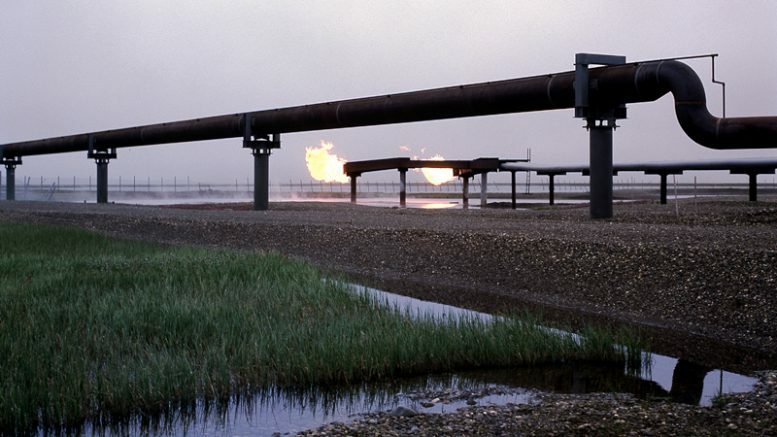 Unorganized areas along the pipeline do not get any tax receipts off the pipeline, it already goes to the state. Look at line one of your chart above.